OR Support has over 30 years’ experience providing millions of dollars in medical imaging equipment, thousands of hours of applications on C-arms and Ultrasound machines, technical and training support on hundreds of Pain Management, Vascular, Urology, Bariatric, Reproductive Health and other medical c-arm tables, to working with and providing c-arms and/or c-arm tables and other medical imaging systems to world-famous facilities like NASA, Harvard and the Cleveland Clinic, to startup, single physician medical practices across the United States, at absolutely the lowest possible cost. Why buy C-arm Tables from O.R. Support? We have over 150 new, demo, remanufactured, refurbished or used C-arm tables in all price ranges from Stille, Steris, Durabuilt, Surgical Tables International (STI), Durabuilt, Oakworks, Medstone, MorganMedesign Tables, Acoma, IdI and many other c-arm table manufacturers. More choices – over 150 imaging tables of all brands to choose from. Pain Management C-arm Tables and Mobile Urology C-arm Tables that are safer for your patients and staff. The PMT 8000 pain management c-arm tables go lower to the floor than any other C-arm surgical tables, making it much easier to get your patients on and off the fluoroscopy table without using a step stool. 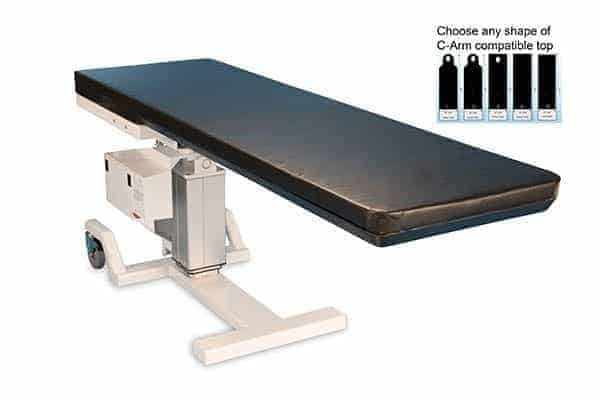 This eliminates the patient and staff safety issue of obese, unstable patients being supported by nurses while stepping up onto a two-step step stool, turning around, and sitting down on the c-arm table. OR SUPPORT has new, demo, refurbished and used C-arm tables available. Please call for availability. Our imaging tables rarely have service issues; but if your system ever requires repair, we have C-arm and imaging table service engineers in every state available to do anything that might be required to get you up and running asap. Your pain management c-arm table is never obsolete. O.R. Support is the only company that can upgrade any of your 8000 series fluoroscopy tables in the field in just a few hours. We can even upgrade your 8000 fixed height table to have motorized movements. We can repair and upgrade many other brands of c-arm imaging tables as well. We offer many creative financing packages. We have rent, rent-to-own, lease, and purchase options available. Additionally, custom leases can be created to fill almost any need and meet any budget. If you have an unusual request, just ask; chances are we have satisfied the same request before. National Sales Office O.R. Support Inc.
O.R. SUPPORT has C-arm, imaging table ultrasound machine, RF Generator, and Autoclave sales and service centers across the U.S. Please call 858-336-1377 for more information.